For the movie theatre in Sheffield, England, see Showroom Cinema. A showroom is a large space used to display products or show entertainment. A showroom is a large space used to display products for sale, such as automobiles, furniture, appliances, carpet or apparel. 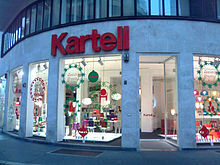 It is a retail store of a company in which products are on sale in a space created by their brand or company. A showroom can also be a space for wholesale buyers to view fashion merchandise for sale in their retail stores. One of the world's largest showrooms is the 35,000 square metres (380,000 sq ft) BMW showroom in Abu Dhabi. The biggest collection of showrooms is a 216,000-square-metre (2,330,000 sq ft) car showroom in Istanbul called Autopia Europia. A showroom is a permanent enclosed space used to present a performance. Sometimes it is customized for a particular show; for example, the Las Vegas Hilton showroom used for the rock opera Starlight Express was customized by pouring concrete ramps onto its stage area and in the seating area. Some showrooms are used daily, while others are only used when a performer is booked to perform. In some cases, a showroom is leased to a performer, who then retains all income rather than being paid by the showroom owner. In fashion capitals such as New York City, Paris, Milan or London one can find temporary showrooms. These places can be rented on a daily or weekly basis. Some temporary showrooms are managed with the help of event management agencies. Temporary showrooms can also be pop-up stores, which are short-term sales spaces. Automobile manufacturer Ferrari has recently introduced augmented reality technology into their showrooms, to provide customers with a more hands-on approach when purchasing a vehicle. Look up showroom in Wiktionary, the free dictionary. Wikimedia Commons has media related to Showrooms (marketing location). ^ Horatiu Boeriu, BMW opens largest showroom worldwide in Abu Dhabi, BMW blog, 2012. ^ Carscoops, World's Largest BMW Showroom Opens in Abu Dhabi, Best Selling Model in the M.E. is the 7-Series, 2012. ^ World Buildings Directory, Autopia Europia Archived 2014-04-19 at the Wayback Machine. ^ Mibz.com, Autopia Europia, The World’s Biggest Car Dealership, Will Have A Circuit On The Roof Archived 2014-04-19 at the Wayback Machine.